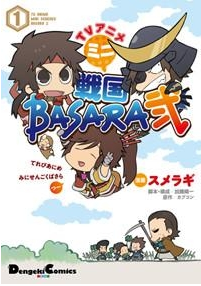 In this post, I'm commenting on both volumes of the Mini Sengoku Basara Two manga series. With a script from Katou Youichi and artwork by Sumeragi, the charming Mini Sengoku Basara series ran in Dengeki Maou between 2010 and 2011 to promote the second season of the anime adaptation (hence the titular "Two"). Fans of the anime will already know the storyline, covering Toyotomi Hideyoshi's rise to power following the defeat of Oda Nobunaga. These two books cover all of the major events from the second series but with a twist; rather than accurately relying on the anime's script, they instead show silly 'What If?' scenarios. What if Motochika and Motonari had visited Azuchi castle before Yukimura popped in halfway through the series? How did Keiji try to stop Toshiie from going on the attack before things escalated to the fight shown in the series? What exactly was Kojuurou doing all of the time he was in Osaka Castle? There are a total of thirty-six chapters spread between these two volumes, however, each story is only a few pages long. As a result of this, even though the script is different, familiarity with the original scenes helps to get the most out of the handful of panels allocated to each joke. One disadvantage of the overall story following the second anime series is that fans might be disappointed to see how infrequently some popular characters show up. Yukimura appears in just a handful of scenes in the entire first volume, though he does make up for it in the second when Takeda Shingen sends him on an important errand with far more violence and misadventure than the anime series showed. Hanbee and Kojuurou steal the show for many of the early chapters, exactly as they did in the Mini Sengoku Basara animated shorts included as extras on the anime discs. With his naturally mischievous face, Hanbee suits the material perfectly, readily acting as either an antagonist or a victim as the situation requires. Hideyoshi too works surprisingly well as a cute, miniature version of himself, his expressionless face somehow perfectly making the transition to the new medium. Since the Sengoku Basara series has so many characters, all of whom have loyal fans and larger-than-life personalities, spin-off works will always face a delicate balancing act to avoid becoming nothing more than a succession of cameo appearances. I feel that Mini Sengoku Basara Two did a pretty good job in that respect; a few characters were cut from the anime but the majority made the cut - even Oyamada and the anime-original Date soldiers. I finished the final chapter wishing only that the manga had lasted longer. Although Mini Sengoku Basara Two is not available in English at the moment, the Japanese is not complex and learners will find it easy to follow, with furigana accompanying all kanji compounds and the archaic speech patterns simplified even further than usual. Both volume one and volume two are available from all good Japanese booksellers. 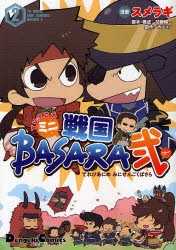 Like the anime series it was based upon, Mini Sengoku Basara has now finished, replaced by the even-cuter Mame Sengoku Basara. Mame Sengoku Basara is based on the game designs and adds the Sengoku Basara 3 characters to the roster, so I'll definitely be covering that once I'm all caught up.